The latest one-minute TV spot for the upcoming Marvel Studios’ film, Guardians of the Galaxy debuted during Game One of the NBA Finals. 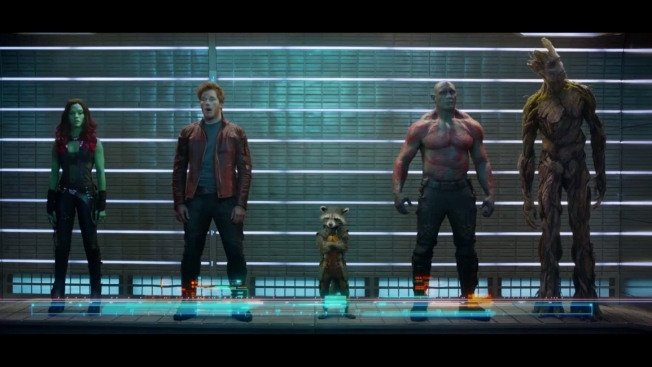 Marvel’s latest action-packed, epic space adventure, Guardians of the Galaxy expands the Marvel Cinematic Universe into the cosmos, where brash adventurer Peter Quill finds himself the object of an unrelenting bounty hunt after stealing a mysterious orb coveted by Ronan, a powerful villain with ambitions that threaten the entire universe. Written and directed by James Gunn, the film stars Chris Pratt, Zoe Saldana, Lee Pace, Djimon Hounsou, Benicio del Toro, John C. Reilly, Glenn Close, Karen Gillan, Gregg Henry, Bradley Cooper, Michael Rooker and Vin Diesel.